Design and development: Brian Jacobs, Julia Smith, Vitomir Zarkovic. Maps: Martin Gamache. Video: Joe Riis. Photographs: David Guttenfelder, Charlie Hamilton James, Joe Riis. Scientific adviser: Arthur Middleton, Yale School of Forestry and Environmental Studies. GIS: Theodore A. Sickley; Matthew M. Hayes and Jerod A. Merkle, Wyoming Migration Initiative, University of Wyoming. Text: Jeremy Berlin. Map edit: Gus Platis. Sources: Matthew Kauffman, Wyoming Migration Initiative, University Of Wyoming; James E. Meacham and Alethea Y. Steingisser, Infographics Lab, University Of Oregon; Andrew J. Hansen, Montana State University; Sarah Dewey, Ann W. Rodman, Douglas W. Smith, Daniel Stahler, Erin Stahler, and P. J. White, National Park Service; Eric Cole, National Elk Refuge; Bruce B. Ackerman and Paul Atwood, Idaho Fish and Game; Ron Aasheim, Justin Gude, Kelly Proffitt, and Neal Whitney, Montana Fish, Wildlife and Parks; Alyson Courtemanch, Renny Mackay and Doug Mcwhirter, Wyoming Game and Fish Department; The Nature Conservancy, Wyoming; National Conservation Easement Database; Montana Department Of Revenue; BLM; USGS. Heading back east, Elk 22 and her calf have to dodge hunters. Though antler-free females are less prized than males, the journey takes the pair through seven open hunting districts. In 2014, 1,741 elk were killed in these districts. But that doesn’t include Elk 22 and her calf: they reached their winter grounds in 30 days. Elk 22 and her calf will spend 113 days in their summer range—a steep area straddling the Continental Divide where the average elevation is 8,900 feet. On October 13, the first snowfall of the season prompts them to begin their journey back east. By the time they leave the park, on October 29, they’ll have covered 360 miles in all. To move from her wintering grounds to her summer habitat, Elk 22 travels 195 miles in 39 days. Her journey—traversing lofty peaks, raging rivers, and remote plateaus—is the equivalent of climbing up Mount Everest from sea level, then trekking back down again. Eighty percent of Yellowstone’s female elk, called cows, give birth during their spring migration. 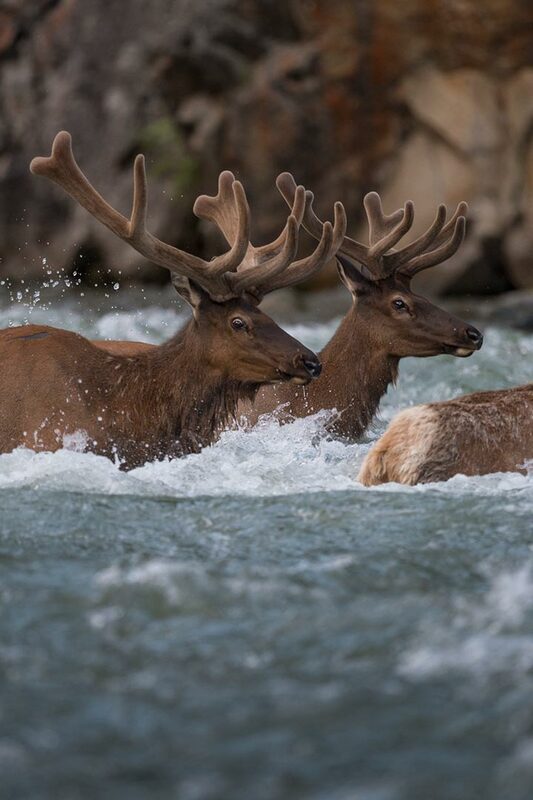 In 2014, using movements from GPS collar data, scientists estimate that Elk 22 gave birth on May 20. Elk 22 winters on a mixture of private ranches, conservation easements, and nature preserves. These areas offer good grazing and safe haven from predators, but they’re dotted with oil and gas development—180 wells operate within Elk 22’s winter range. Around May 15, Elk 22 will start heading west on her annual journey to Yellowstone National Park. The maps that follow show each step that a single migratory elk, a female called Elk 22, takes over the course of a year. Her arduous journey—into Yellowstone National Park in spring, back out to adjacent lands in autumn—is fraught with hazards, including extremely rugged terrain and an abundance of seasonal hunters. The Greater Yellowstone Ecosystem is a complex mosaic of state, private, tribal, and federal lands, including Yellowstone and Grand Teton National Parks. Migrating elk must negotiate areas that range from protected summer grazing land to privately owned tracts. About 6,000 elk comprise the Cody herd. Some spend winter along the Shoshone River, but the majority cluster near the Greybull. This group makes one of the world’s most dramatic migrations. To reach lofty, remote plateaus each spring, they traverse steep mountain passes and swollen rivers. On the return trek in fall, they must contend with hunters. This map shows the migratory routes of nine elk herds, each named for where it winters. The herds flow back out into the surrounding region when autumn snow begins to fall. 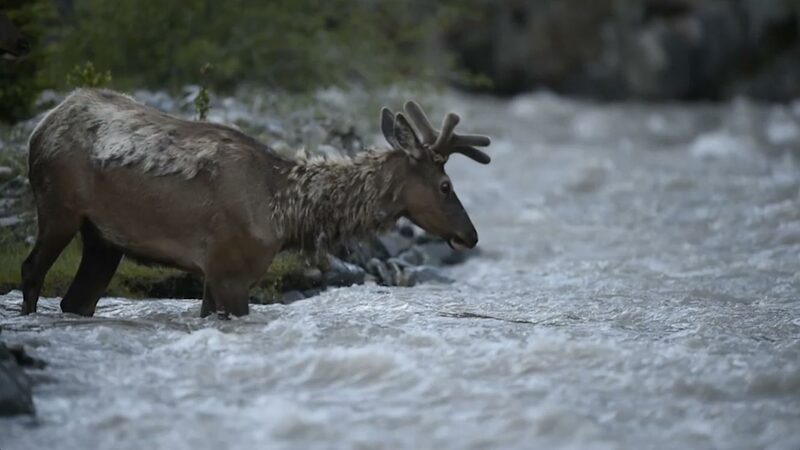 Each spring tens of thousands of elk flow into the park to feed on high-altitude vegetation. This map is one of the first to use GPS data from collared elk to depict all of the herds’ migration corridors—the veins and arteries of Yellowstone. Elk are shown here in their winter feeding grounds. Nine discrete elk herds, totaling 10,000 to 20,000 individuals, compose what ecologist Arthur Middleton calls the Greater Yellowstone superherd. These herds spend their summers in the core protected area of the Greater Yellowstone Ecosystem. Their seasonal migrations—into the park each spring, then back out again in autumn—are among the most stable, the most arduous, and the most studied. This map shows the boundary used by the Greater Yellowstone Coordinating Committee, a federal partnership. Wildlife officials and researchers say that managing the region as a single ecosystem—an approach that’s controversial with many nonfederal landowners—is key to increasing sustainability. Elk were once ubiquitous in North America. Yet like bison, they were nearly hunted to extinction in the late 19th century. Elk have since rebounded and, thanks to better wildlife management, have recolonized much of their former range. In Wyoming, state and federal agencies keep elk numbers up by stocking select winter feeding grounds with hay. Bison, bear, wolf. Each animal is an emblem of Yellowstone National Park. But the true pulse of the Greater Yellowstone Ecosystem is the hoofbeat of elk, the park’s most abundant large mammal. The annual migrations of these great deer support a unique complex of scavengers and carnivores that, outside the park, includes human hunters. THIS EXPERIENCE WAS OPTIMIZED FOR DESKTOP AND MOBILE. WE INVITE YOU TO GO TO A LARGER SCREEN TO ENJOY THE FULL EXPERIENCE.